Spectruss, a full-service marketing agency located in Chattanooga, is seeing substantial advertising growth. 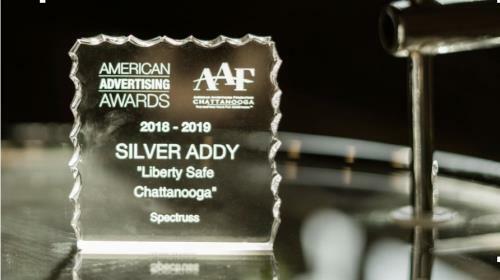 This month, the agency was awarded the 2018-2019 Silver ADDY for their viral video, “Randy the Safe Guy” by the American Advertising Federation of Chattanooga. The commercial was featured on Reddit, Digg, Info Wars, and thebigshow.com, receiving over three million views worldwide. Spectruss created the award-winning commercial for their client, Liberty Safes of Chattanooga. This edgy video demonstrated a way to promote their products online while overcoming the Facebook ban on the sale of guns. It featured “Randy the Safe Guy” and showed a creative way to design an entertaining commercial while promoting guns and accessories without ever mentioning the word “gun”. After this commercial went viral, Liberty Safe’s National Company requested Spectruss to continue to produce commercials for their national network. The agency’s continuous growth also consisted of promoting a current team member to an all- new digital marketing position and bringing on a new team member. 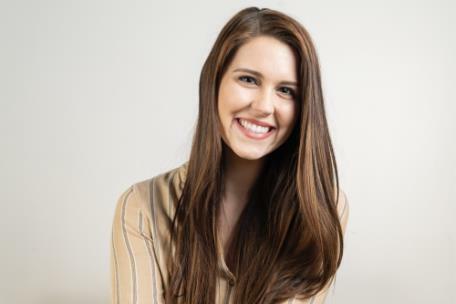 Erin Taylor, who previously held the role of Client Relations and Content Manager, was promoted to Digital Marketing Specialist. Her new role will be to develop innovative marketing strategies for clients and other techniques to generate leads, optimize conversions, and track/ improve results. Ms. Taylor will also perform bid management as well as monitor campaigns, budgets, and performances. Ms. Taylor left her home state of South Carolina after graduating from college and has now made Chattanooga her new home. Prior to joining the Spectruss team, she held various marketing positions where she grew to love storytelling and relationship building. With experience at two other agencies, she brings a wide variety of communication skills to her role at Spectruss, where she supports a variety of projects. She earned a Bachelor of Arts degree in Journalism and Mass Communications, focused in Public Relations from The University of South Carolina. When she’s not in the office, she loves outdoor adventures, eating at local restaurants, and supporting her Carolina Gamecocks. 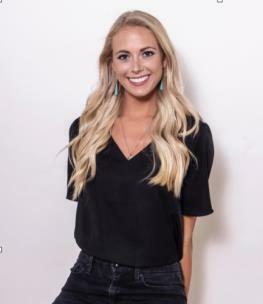 Her perfect day is inside the William-Brice Stadium, the home football stadium for the South Carolina Gamecocks, or skiing down a breathtaking slope outside the country with her father. Spectruss welcomes Jessica Frampton to the team as the new content manager. She recently graduated from Liberty University with a degree in business, focused in digital marketing. Through college, she worked for various companies gaining business knowledge and growing customer relationships. She has a passion for small businesses and finding creative ways to increase growth. Ms. Frampton hails from Virginia. After getting married, she moved to her husband’s hometown of Chattanooga. Outside the office, you can find her adventuring outdoors and trying local foods. During the colder season, she is an avid snowboarder and loves taking trips to the slopes. You can also find her playing sand volleyball or kayaking along the river. She is always on the hunt for great sushi or finding a local winery.